All we know very well that there are billion of Android mobile phone users around the world. Lot of time few common security mistakes done by Android phone users due to which we lost our important and personal data. Android phones has lot of interesting features and available at cheat price due to which they are more popular. At present time there is a big market occupied by the Android phone around the world. But sometimes you do few common mistake due to which you have to lost your important data and information. So, today we have to discuss about few common security mistakes done by Android phone users. We know that data security is most important in your Android phone. But sometime few common security mistakes done by Android phone users due to which your confidential and personal information will be leaked. Lot of person don’t like to turn on his Android phone tracking option. If you lost your Android phone and your tracking option is turn-off then you will not be able to track the exact location of your phone. You can also not able to delete you important and confirmation data. It is the best security option to turn on your phone tracking option due to which you will be able to easily track your lost phone as well as delete your important and confidential information. Lot of time different unauthorized person send different kind of bugs via email, SMS into your phone. When you open these emails or SMS they will crack your phone security and get control to view all important information of your phone. Most of the companies provide software and apps updated in regular interval. If you regularly update your phone and apps then your phone data will be safe. 1. If you want to check or update your phone then tap on the “Settings” option. 2. Tap on the “About phone” option. shows your system is up to date. All we know virus plays an important role to crack your phone security and leak your important and confidential information’s. Lot of unauthorized person trying to get control of your Android phone and steal your important information by sending the virus in your phone from email or any attachment. Most of the person don’t like to use antivirus in his phone due to which your phone security not only crack but also corrupt your phone settings also. If you want to keep safe your data and phone then you have to install Antivirus in your phone and regular scan your phone with the Antivirus. It will check and remove all virus from your Android phone. One thing you have also remember that you have to regular update your Antivirus due which you will get lot of benefits. Old antivirus not able to deduct and remove the latest virus but if you have upgraded Antivirus then it will be able to easily deduct and remove all latest virus from your phone. Most of the person don’t like to set or use phone lock feature in his Android phone. It is a big common mistake which they have done. If you don’t have any kind of lock on your phone then anyone will be able to check and steel your important and confidential information from your phone. If you lost or forgot your phone at any place then you will not be able to trace your phone location and also not able to delete your important information. So, it is very important thing that you have to use any type of phone lock feature on your Android phone. You have to use pin, pattern, smartlock, face deduction and other features of your phone. Different companies provide fingerprint scanning lock features which play an important role to make strong security of your phone. 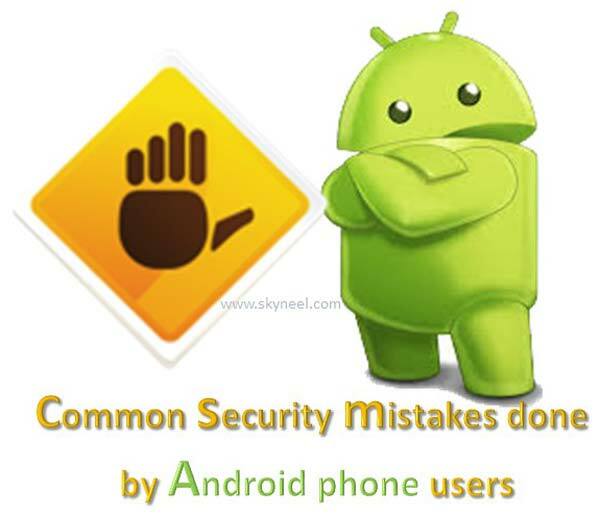 I hope after reading this article you will be aware with common security mistakes done by Android phone users and also get solution how to keep safe your phone and important data. We believe safety play an important role of our life so, keep safe your phone. If you have any suggestions regarding this article then write us in the comment box. Thanks to all. Thank you for your for the information and guidance on these android matters. They have proven to be most useful. Thank you. Those were really helpful tips for a beginner like me. Hope others find them useful as I.